What do you love about soup? I love soup for so many reasons. It’s quick, easy and economical to make. You can make a soup with pretty much any ingredients you like. It’s also wonderful because you can easily make a big batch and have enough leftovers to use for lunches and still freeze some for those nights you need a ready-made meal. And most of all, it’s warm and comforting. I have quite a few positive soup-related memories that contribute to my love of soup. Tomato soup and open faced cheese sandwiches are the first food I remember cooking at my preschool when we made lunch for our parents. Making that lunch is such a fond memory of mine. I am certain the experience is one of the reasons I have always loved to cook. We even made those placemats with wax paper and leaves. Remember those?! Anyway, my mom used to make tomato soup and cheese toast for us when we would have a babysitter. And my grandmother, who I loved dearly, and who was an amazing cook, used to make a Russian Cucumber Soup made with tarragon, cucumbers, chicken and sour cream that I absolutely loved. She served it with homemade bread or biscuits and salad. That meal was one of my favorites! Do your children like soup? Mine do – now, at least. But they didn’t when they were younger. If my memory is correct (and sometimes it definitely isn’t!) 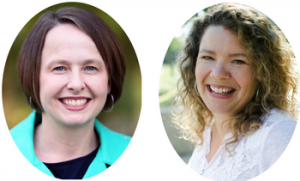 my girls didn’t like mixed-texture foods, like soups, when they were toddlers and preschoolers. My 10 year old still doesn’t love soup. She tends to eat just the broth. She will also eat soups like black bean that are more smooth in texture. I don’t worry if she just eats the broth because I know she gets some of the nutrients from ingredients like the kale cooked in the broth. 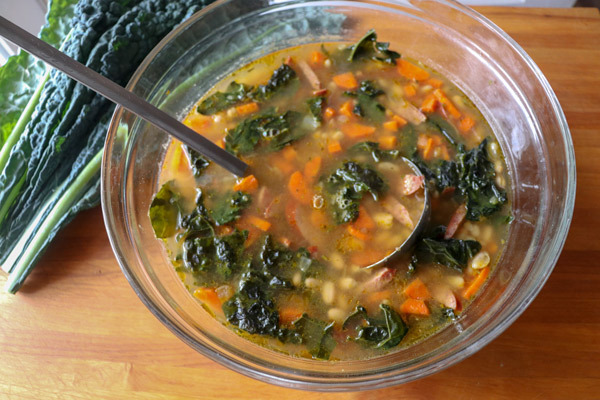 Here’s a White Bean, Sausage and Kale Soup to warm you up during the wintery weekend. Serve it with bread and a simple salad like my Favorite Everyday Salad with Mustard Vinaigrette and you’ve got yourself a meal! 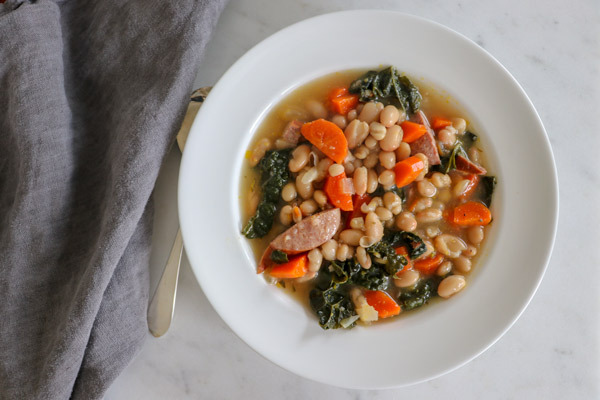 Whether you’re cooking for yourself or a family of 2 or 3 or more, this easy-to-make White Bean Sausage and Kale Soup will warm you up. 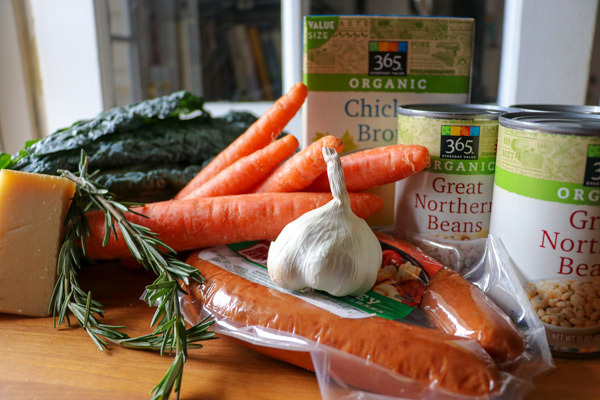 Here’s all you need to make the soup. First, slice the sausage lengthwise and then crosswise. 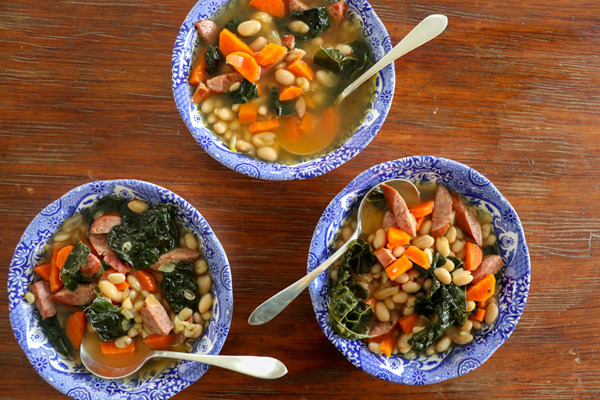 I usually use turkey kielbasa because I like the flavor of it in this soup. You can use any kind of sausage you like. Drizzle a tablespoon of olive oil in a dutch oven and add the sliced sausage. Cook over medium high heat, stirring occasionally until they start to brown. While the sausage is browning, peel and dice a small onion and peel and chop 2 cloves of garlic. 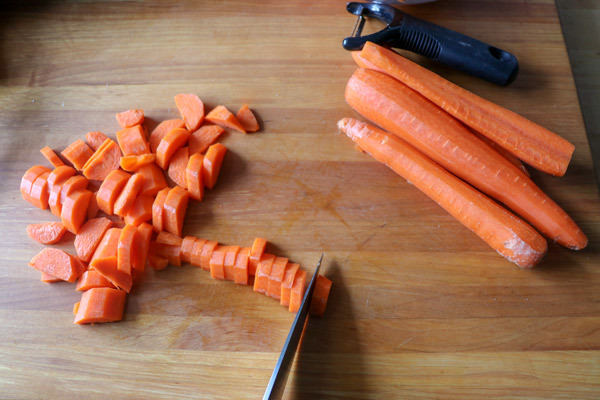 Next, peel and cut 6-8 carrots. That’s my FAVORITE peeler in the photo there. I love that thing! My mother-in-law sent it to me recently. How have I never owned one this nice before!? It’s an OXO Good Grips Y-Peeler. Remove the browned sausage from the pan. Add the onions and garlic along with 2 teaspoons salt and a few grinds of fresh pepper and saute on medium heat for about 4 minutes. Be sure to stir them a few times. Next, add the chopped carrots and cook, stirring occasionally for another 5 minutes. 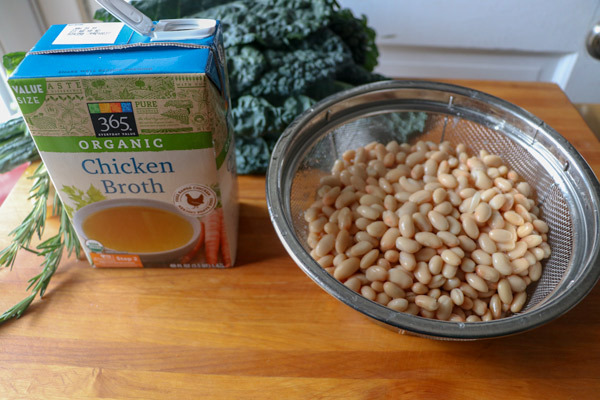 Then, add 32 ounces of chicken stock, 3 cups of water and 3-15 oz cans of white beans. Be sure to drain and rinse the beans before adding them to the pot. I tend to drain and rinse all canned beans because the flavor of the liquid tends to stand out. Rinsing them also gets rid of some of the sodium. I tend to buy organic chicken stock. I usually buy the low sodium one, but must have grabbed the regular this time. I like to use low sodium stock or broth otherwise the soup can taste overly salty. I like to be in charge of the saltiness of the soup. Bring the soup to a boil over high heat. While you’re waiting for it to come to a boil, chop 1 tablespoon of fresh rosemary. And cut a 1 x 3 inch hunk of Parmesan cheese. Add the parmesan and rosemary to the pot. Once it comes to a boil, turn it down to medium heat and let it simmer. Add the browned sausage back to the pot. Then add the washed and torn kale. Simmer this pot-of-yum for 10 minutes. Now remove the piece of Parmesan. 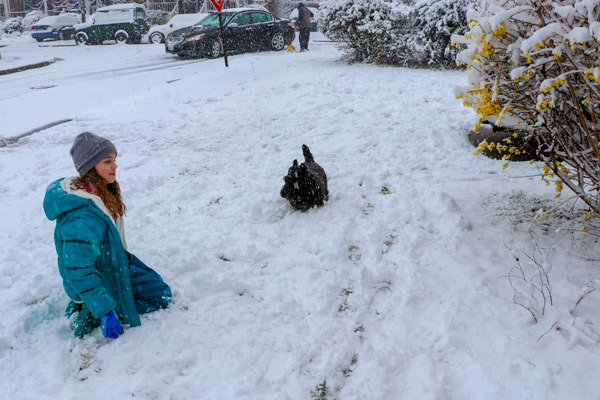 Taste the soup for season and adjust if it needs more salt. To cool the leftover soup, carefully transfer it to a large bowl. Leave a metal spoon or ladle in the bowl and stir the soup occasionally (this releases heat) as it cools. Add a salad and some bread and you’ve got yourself a lovely meal for a cool spring day. *This post contains an affiliate link. Thank you for supporting us as we work to spread positive message about food and nutrition. 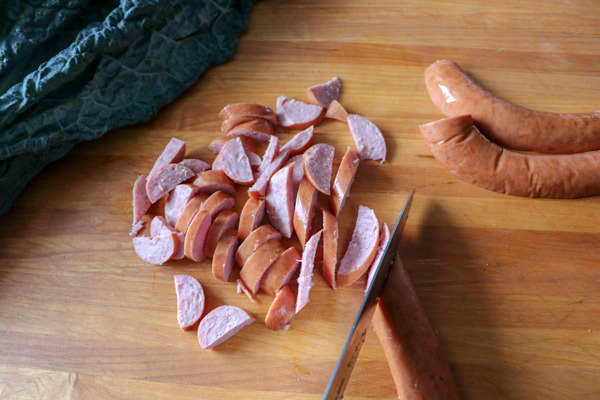 Slice the kielbasa in half lengthwise and then slice it crosswise. Heat 1 tablespoon olive oil in a stock pot. 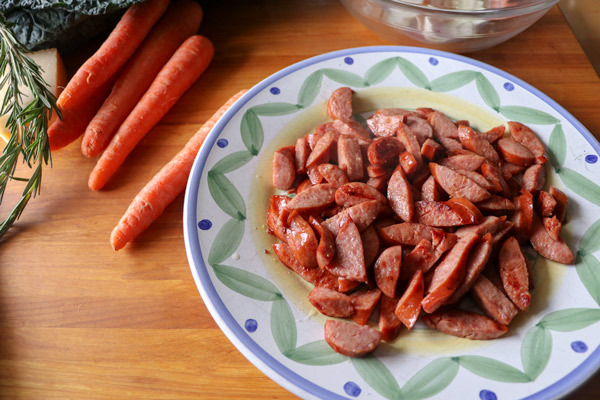 Add the sliced kielbasa and cook on medium high until lightly browned, about 5 minutes. Stir occasionally. Once the kiebasa is browned remove it from the pan and set aside. Add the onion, garlic and salt and pepper to the pan and sauté on medium for 3-5 minutes, or until they begin to soften. 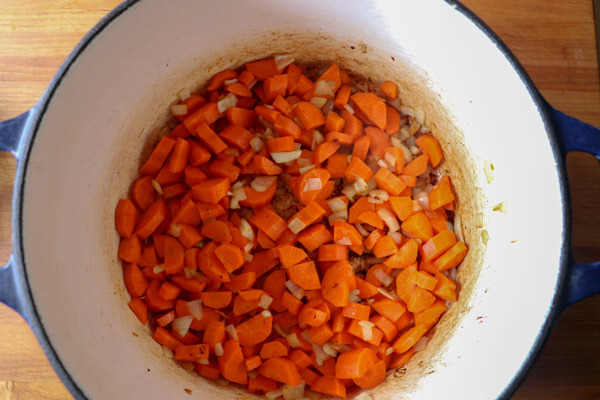 Add the carrots and cook, stirring occasionally. Drain and rinse the white beans and add to the pot. Add the chicken stock, water, rosemary, and Parmesan piece. Bring to a boil. Then turn the heat down to medium and let the soup simmer for 10 minutes. 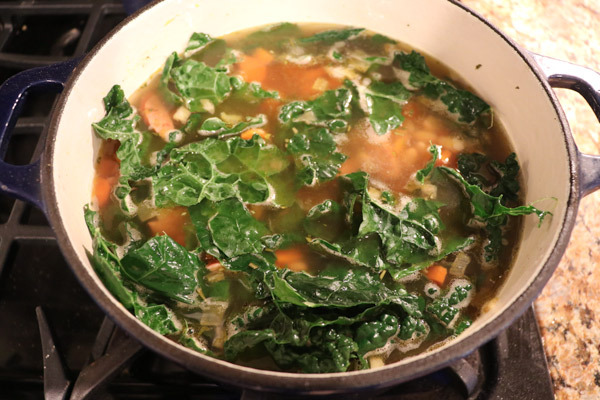 While the soup is cooking, remove the ribs from the kale and tear the kale into bite size pieces. 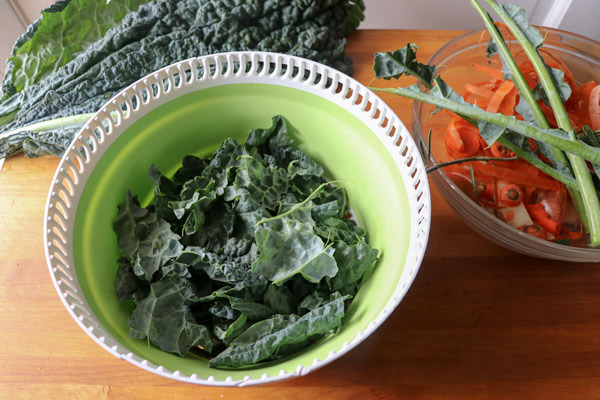 Rinse the kale under cold water and add to the soup. Simmer for 10 more minutes. 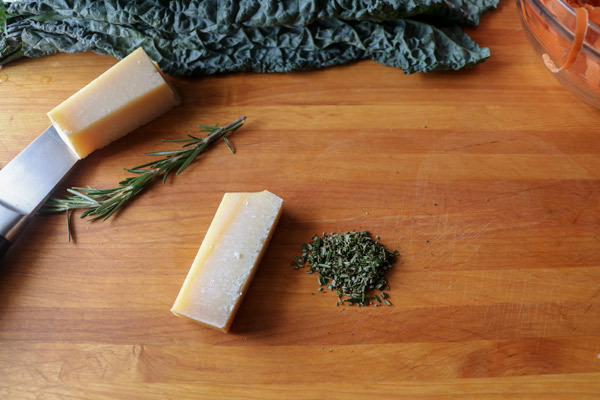 Remove the piece of Parmesan. Taste the soup for seasoning and add more salt and pepper if needed. To cool the soup, carefully transfer it to a large heat proof bowl. Stir occasionally as it cools. 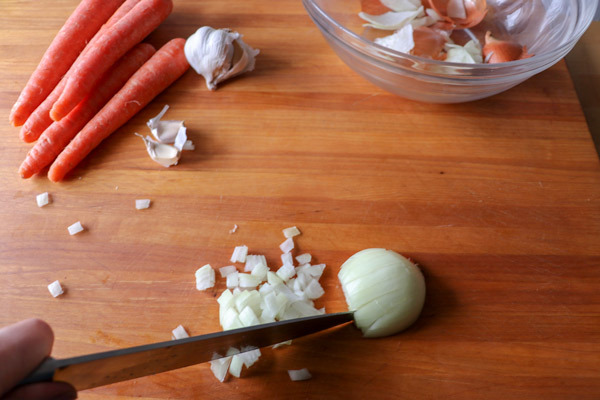 If you want to cook the soup longer, it will enhance the flavor.